Moving swiftly on to the second part where I am going to look at the “all data types in planning file format” load type in Data Management, the functionality is basically the same as what I covered in the last part with the on-premise Outline Load Utility but has now been built into Data Management, I am hoping that by providing the examples in the last post it will make more sense when setting up the integration in Data Management. Currently the functionality only exists in EPM Cloud but I would expect this functionality to be pushed down to on-premise FDMEE possibly when 11.1.2.4.220 is released, I will update this post once it is available. Once again I will start out with the same employee benefits source data but this time the file can be kept much simpler as Data Management will handle the rest. Just like with on-premise the data load settings need to be applied and these can be accessed through the navigator under integration. It is a shame that these settings cannot be dynamically generated or be defined in Data Management instead of having to set them in planning. On to Data Management and creating the import format, the file type is set to “Multi Column – All Data Type”. In the import format mappings, I have basically fixed the members to load to by entering them into the expression field, this replicates the example in the last part using the OLU and fixing the POV in the file. For the account dimension I could have entered any value in the expression field as it will be mapped using the line item flag in the data load mappings. The Data dimension will be defined by selecting add expression and choosing Driver, I explained this method in detail in a previous blog on loading non-numeric data. Basically the driver dimension is selected which in my example is the Property dimension, the first row is the header row and contains the driver members and the data is across five columns. 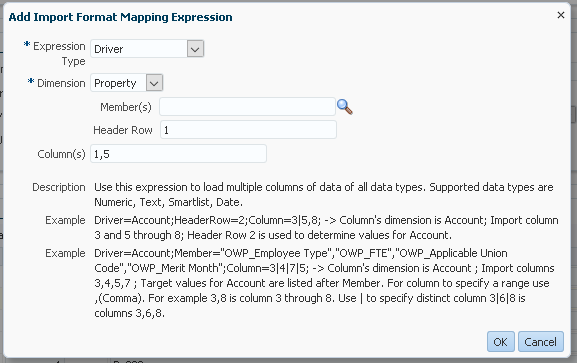 The mapping expression window provides examples if you are unsure of the format and the expression field will be updated with the values entered. The data rule is created in the same way as any other integration. The difference comes when setting up the target options, the load method this time will be “All data types in Planning File Format”. There are also properties to define the Data load and Driver dimensions, these will match what has been set in the Data Load Settings in planning. Seems a bit excessive having to set the driver dimension in planning, in the import format and in the data load rule, it would be nice if all these settings could be applied in one place in Data Management. There is only one difference with data load mappings and that is for the data load dimension the LINEITEM format must be used. The target value will need to be manually entered with the data load dimension parent member but after going through my example with the OLU it should be clearer to why it is required. On to the data load and the data columns in the file will be converted into rows in the workbench. In my source file there are five columns and four rows of data so a total of twenty records are displayed in the workbench. The final step is export and load the data in to the planning application. All good but a quick check of the data form in planning and something is not right. Only the equivalent of one row of data has been loaded and the data that has been loaded is not correct. The process log confirms that the outline load utility is definitely being used to load the data just like with the earlier example I went through, though in this case only one row has been processed and loaded. 13:10:36 UTC 2017]Outline data store load process finished. 1 data record was read, 1 data record was processed, 1 was accepted for loading (verify actual load with Essbase log files), 0 were rejected. I checked the file that Data Management had generated before loading with the OLU and even though the format is correct there was only one record of incorrect data in the file. The file is generated by converting rows into columns by using the Oracle database pivot query and outputting driver members and values as XML. 13:10:29,528 DEBUG [AIF]: SELECT * FROM ( SELECT ACCOUNT,UD4,DATA,'"'||ENTITY||','||UD1||','||UD2||','||UD3||','||SCENARIO||','||YEAR||','||PERIOD||'"' "Point-of-View"
I replicated the data load in on-premise FDMEE, ran the same SQL query and only one row was returned. The query returns the driver members and values as XML which then must be converted into columns when generating the output file. At this point I thought it might be a bug but thanks to Francisco for helping keep my sanity, I was missing a vital link which was not documented, I am sure the documentation will get updated at some point to include the missing information. If you have records that are against the same POV then you need a way of making the data unique so that when the SQL query is run all rows are returned, this is achieved by adding a lookup dimension and identifying a driver member that will make the data unique. If you take the data set I am loading the driver member “Grade” values are unique so this can be defined as a lookup dimension. To do this you first add a new lookup dimension to the target application. The lookup dimension name must start with “LineItemKey” and depending on the data that is being loaded you may need multiple lookup dimensions to make the records unique. Next in the import format mappings the dimension should be mapped to a column containing the driver member. The “Grade” member is in the first column in my source file so I map the lookup dimension to that. After adding a like for like data load mapping for the lookup dimension the full load process can be run again. The workbench includes the lookup dimension and is mapped to the driver member Grade. The SQL statement to generate the file now includes the lookup dimension which was defined as column UD5 in the target application dimension details. 17:16:36,836 DEBUG [AIF]: SELECT * FROM ( SELECT ACCOUNT,UD4,DATA,'"'||ENTITY||','||UD1||','||UD2||','||UD3||','||SCENARIO||','||YEAR||','||PERIOD||'"' "Point-of-View"
Once again I replicated in on-premise and the query correctly returns four records. Even though the query results include the lookup dimension this will be excluded when the output file is created. This time the process log shows that four records have been loaded using the OLU. 17:16:49 UTC 2017]Outline data store load process finished. 4 data records were read, 4 data records were processed, 4 were accepted for loading (verify actual load with Essbase log files), 0 were rejected. The planning form also confirms the data has been successfully loaded and is correct. The unique identifier members are “Grade” and “Benefit Type”, data already exists under “Total Benefits” for “Grade1” and “Health Insurance” so the data being loaded should replace the existing data. Now let us load a new set of data where there is no matching data for the unique identifiers. Before the load there was no data for “Grade 3” so the data should be loaded to the next available child member of “Total Benefits” where no data exists for the given POV. The data has been loaded against next available member which is “Benefit 5” as no data previously existed for the given POV. Next to test what happens when loading a data set with no matching driver member identifiers now that all child members of the data load dimension parent are already populated. The export fails and the process log contains the same error as shown when testing the OLU as in the last post. 13:21:07 UTC 2017]com.hyperion.planning.HspRuntimeException: There is no uniquely identifying child member available for this member defined in Data Load Dimension Parent. Add more child members if needed. 13:21:07 UTC 2017]Outline data store load process finished. 1 data record was read, 1 data record was processed, 0 were accepted for loading (verify actual load with Essbase log files), 1 was rejected. As the log suggests in order for the export to succeed additional members would need to be added under the data load dimension parent. Since adding the lookup dimension all the data values have been unique for the “Grade” member so there have been no problems, if I try and load a new set of data where the values are no longer unique you can probably imagine what is going to happen. The above data set contains “Grade 1” twice so now the lookup dimension is not unique and even though the load is successful we are back to where we were earlier with one record of incorrect data being loaded. This means another lookup dimension is required to make the data unique again so I added a new lookup dimension, mapped it to the “Benefit Type” column in the import format, created a new data load mapping for the new dimension and ran the process again. In the workbench, there are now two lookup dimensions present which should make the data unique when creating the export file. Much better, the data loaded to planning is as expected. In the whole the functionality in Data Management acts in the same way as when using the on-premise Outline Load Utility, I do feel the setup process could be made slicker and you really need to understand the data as if you don’t define the lookup dimensions to handle the uniqueness correctly you could end up with invalid data being loaded to planning. Recently a new load method was added to Data Management in EPM Cloud, there was no mention of it in the announcements and new features monthly updates document so I thought I would put together a post to look at the functionality. The new load method is called “All data types in Planning File Format” which may be new for Data Management but the core functionality has been available in the Outline Load Utility since 11.1.2.0 of on-premise planning. The naming convention has changed in the cloud and on-premise since I originally wrote this post, "All data types in Planning File Format" is now known as "All data types with auto-increment of line item"
I must admit that in the past when I first read the same information in the planning documentation it wasn't clear to me how the functionality worked. It looks like the above statement in the cloud documentation has been copied from on-premise and is a little misleading as in Data Management you don’t have to include the flag in the source file because it can be handled by data load mappings. Before jumping into the cloud I thought it was worth covering an example with the on-premise Outline Load Utility because behind the scenes Data Management will be using the OLU. As usual I am going to try and keep it as simple as possible and in my example I am going to load the following set of employee benefits data. Using the LINEITEM flag method with the OLU it is possible to load the data to child members of a defined parent without having to include each member in the file, so say you need to load data to placeholders this method should make it much simpler. You can also define unique identifiers for the data so in the above example I am going to set the identifiers as Grade and Benefit Type, this means if there is data in the source file which matches data in the planning application against both the identifiers the data will be overwritten, if not the data will be loaded against the next available child member where no data exists for the given point of view. It should hopefully become clearer after going through the example. 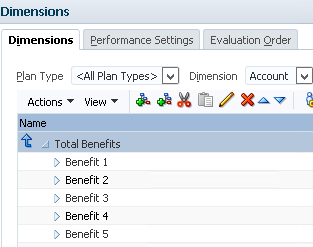 I have the following placeholder members in the Account dimension where the data will be loaded to, the Account dimension will be set as the data load dimension and the member “Total Benefits” will be set as the parent in the LINEITEM flag. The data in the source file will be loaded against the following matching members in the Property dimension, these will be defined as the driver members. The members are a combination of Smart List, Date and numeric data types. I created a form to display the data after it has been loaded. Before creating the source file, there are data load settings that need to be defined within Data Load Administration in the planning application. 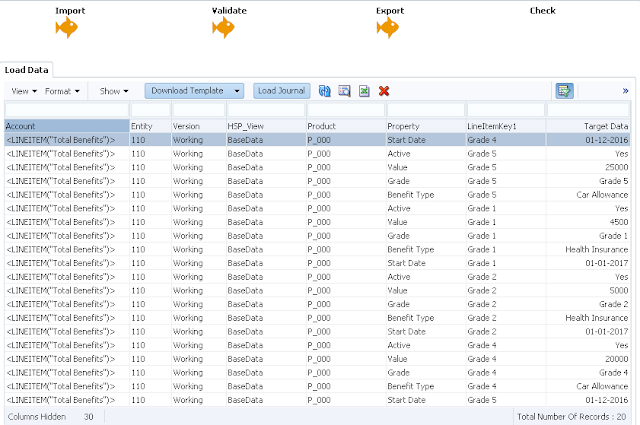 The Driver Dimension is set as Property and the members that match the source data are defined as Benefit Type, Grade, Start Date, Active and Value. 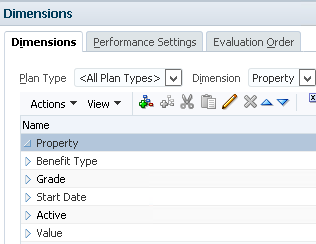 The Unique Identifiers in the property dimension are defined as Benefit Type and Grade. Now on to creating the source file, if you have ever used the OLU to load data you will know that the source file will need to include the data load dimension member which in this case will the line item flag, driver members, cube name and the point of view containing the remaining members to load the data to. You may ask why does the line item flag need to be on every record when it could just be included in the parameters when calling the OLU, this would make sense if loading data to children of only one member but it is possible to load to multiple members so it needs to be included in the source file. The final step is to load the data file using the OLU and the parameters are the same as loading any type of data file. 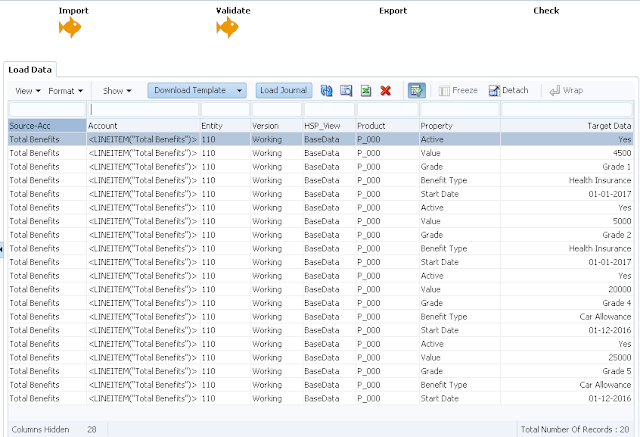 /M: = Generate data load fields from header record in file. You could also include the -f: parameter to set the location of an encrypted password file to remove the requirement of entering the password manually at runtime. After running the script the output log should confirm the status of the data load. Planning Outline data store load process finished. 4 data records were read, 4 data records were processed, 4 were accepted for loading (verify actual load with Essbase log files), 0 were rejected. In my example four records were successfully loaded which is what I was hoping for. Opening the form I created earlier confirms the data has been loaded correctly. As no data previously existed for the POV the data was loaded to the first four children of “Total Benefits” and the unique identifier members would not apply in this case. As matching data values already exist for “Grade 1” and “Health Insurance” under “Total Benefits”, this means the data should be updated instead of data being loaded to the next available child member. The data has been updated where the identifier data values match and in this case the Active member data has changed from Yes to No. Now let us load a new record of data where data values don’t match for the identifier members. 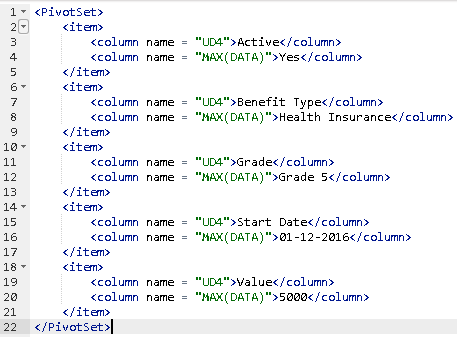 In the above example there is currently no matching data values of “Grade 3” and “Health Insurance” so the data should be loaded to the next available child member of “Total Benefits” where no data exists for that POV. So what happens when you try to load data and there are no available members left. 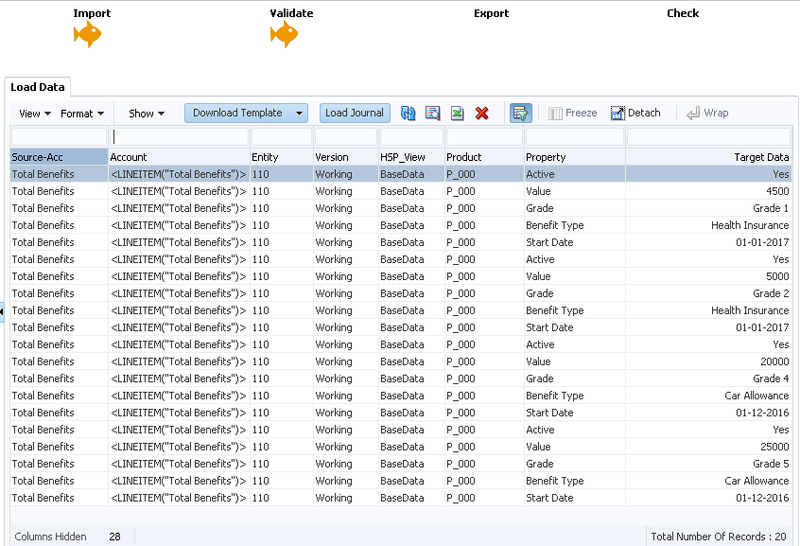 All five child members of “Total Benefits” have data against the above POV and as there is no matching data for the unique identifier combination the load fails with the following messages. Outline data store load process finished. 1 data record was read, 1 data record was processed, 0 were accepted for loading (verify actual load with Essbase log files), 1 was rejected. At least the log provides exactly what the issue is and how to resolve. I am going to leave it there for this post and in the next part I will look at how the same functionality has been built into FDMEE/Data Management and go through similar examples.